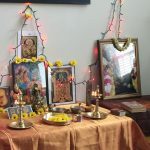 The first Anniversary of GOD Hartford Satsang was celebrated in a grand manner on Sunday Jan 23, 2011 at Hartford. 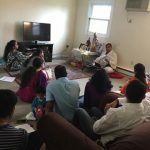 The Hartford Satsang had its humble beginnings on January 23rd 2010 at the residence of Sri Madhanji at Capitol View Apartments in Hartford in the presence of Sri Ramanujamji. 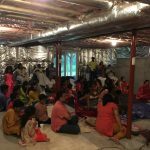 Over the year, the satsang convened regularly over every weekend performing Mahamantra Kirtan and learning Srimad Bhagavatam under the guidance of Sri Narayananji from Boston over telephone. 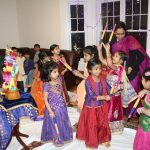 The Anniversary celebrations took place at a community hall in Hartford, CT. More than 60 friends and neighbors came to participate in the event, in spite of sub-zero temperatures outside. The satsang started with Mahamantra Kirtan, following which, Sri Hariji welcomed the gathering and gave an introduction about the satsang. Following this, Sri Madhanji, Sri Hariji, Sri Arulji and Smt. Rukminiji recounted their experiences on how the Nama Sankirtan and satsang brought transformation in their own lives. 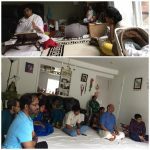 Following this, Sri Narayananji from Boston gave a talk on Spirituality for the current age. In his talk, he said that one need not renounce worldly life to pursue spirituality. Being placed in a satsang is one of the greatest gifts that one can be bestowed with, and the greatest benefit of a satsang is the ‘viveka’ – the clarity of mind. More satsang makes one more attuned to experience divine grace of the Sadguru and Krishna. He explained how, life would become a lyric, when one is in constant satsang and keeps the Divine Name on his lips. Towards the end of the talk, a mass prayer with Mahamantra Kirtan was performed with prayers for the satsang to flourish more and more, and for peace, prosperity and happiness throughout the year. Farewell was bid to Sri Arulji and Smt Rukmini-Sri Hariji as they were moving back to India. Prasad was distributed to all the participants.